Volunteers Around the World is raising funds to cover the brain surgery of Rosa Capccha from Zurite, Peru. It is our goal to raise at least $15,000 to cover Rosa’s complex surgery, hospitalization, radiotherapy and recovery. Read Rosa’s story below! Rosa is a 35 years old woman from Zurite, Peru, located about one hour outside of Cusco, Peru. Rosa has one 9 year old boy named Danilo. She is a housewife who dedicates her time to take care of his son, her house and her little guynnea pigs. On May 2016, she started noticing one of her eyes showed a different shape. She didn´t know what it was. Almost a year later, Rosa went to a VAW Mobile Clinic at Yanama and our Dr. John Huamanquispe noticed the shape of her eye asked her to get a tomography. It showed a “Cavernous sinus meningioma” a slow-growing tumor that is causing loss of vision in her left eye; but most important is putting her life in risk because she has a ver high probability of having a brain stroke (cerebral thrombosis). Unfortunately, Rosa is not able to afford the surgery. And since it is a very complex procedure and long recovery we ask you to please consider donating so that Rosa can live many years more. You can donate on Rosa’s Empowered page here and see a video about Rosa’s case here. Any amount will help! Volunteers Around the World is raising funds to cover the heart surgery of Abrandy from Dominican Republic. It is our goal to raise at least $15,000 to cover Abrandy’s surgery, transportation and recovery. Read Abrandy’s story below! Abrandy Collado and her family live a small town outside of Jarabacoa in the Dominican Republic, where medical care is very limited. When Abrandy was 1 month old, her parents realized she was turning blue and purple and it was very hard for her to breath. They desperately raced to the hospital for help, but when the doctors saw the little baby they said that there was nothing they could do with the resources available at the local hospital, so they put her on oxygen and sent her to the bigger hospital in Santiago, a city 45 mins away. Since the family had no money and no medical insurance, they had to go to the public hospital. Abrandy was hospitalized for 20 days. After, her parents received the news that they would not be able to fix Abrandy’s heart problem because the public hospital didn’t have the technology or the resources for the operation. Abrandy’s parents were sent back home with their tiny baby, just waiting for the child to die due to lack of oxygen. 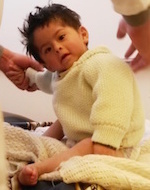 Soon after, one doctor called them and sent the family to a private clinic so Abrandy could receive a catheterization. It temporarily relieved the issue and Abrandy got a little bit better; however, her heart problem is still present and puts her life at a constant risk. Initially, the doctors said she Abrandy could not live longer than 1 year. She is now 3 years old. When she came to Volunteers Around the World’s clinic, the doctors noted that her fingers and lips were purple. Her fingers are in a drum-like shape. She gets tired of walking more than 10 steps. Luckily, it is a problem that can be fixed at a medical center in Santo Domingo, the capital of the Domincain Republic. Abrandy is a beautiful and joyful little girl. She will be able to live if we all help her by making the surgery possible. You can donate on Abrandy’s Empowered page here. Any amount will help! Please consider donating. Any amount will help! This summer, Rice Volunteers Around the World went to Bocas del Toro in Panama where we, among other things, volunteered at Casa de Asilo, an assisted living facility for the elderly and mentally disabled. There, we met residents like Martha, who has severe OCD leading to compulsions that include wandering around the yard picking up grass, especially near the back fence. 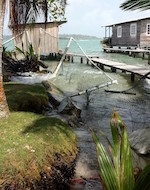 However, for over a year now, Asilo has been dealing with the problem of a collapsed seawall under the surrounding fence, rendering a portion of the yard vulnerable to the ocean and dangerous rocks. Two residents, including Martha, have already fallen in, almost drowning. Because there are not enough employees to watch after them, these residents now have to be tied down during the day so they won’t put themselves in further danger. If we are able to raise $6000, we will be able to repair the damaged portion of the concrete fence, and allow these residents to wander freely again. Please join us in supporting this important cause by donating and sharing this page with others. You can donate on Asilo’s Empowered page here and see a photos of the Asilo fence here. Any amount will help! Meet Gadiel from Zurite, Cusco, Peru. Gadiel has a psychomotor impairment, although the root cause is unknown. He is one year and three months old. Given his current impairments, however, he has the psychomotor abilities of an eleven-month-old. The doctors who attended to Gadiel at VAW’s mobile clinic in Zurite believe that he still has a chance to make a full or close to full recovery in his psychomotor abilities. Gadiel will need to attend rehabilitation and stimulation sessions three times per week for six months. Please consider donating to Gadiel so that he can receive his rehabilitation and the chance to recover his psychomotor abilities! You can donate on Gadiel’s Empowered page here and see photos of Gadiel and his mother here.